184 pages | 10 B/W Illus. The recent surfacing of actor-network theory (ANT) in tourism studies correlates to a rising interest in understanding tourism as emergent thorough relational practice connecting cultures, natures and technologies in multifarious ways. Despite the widespread application of ANT across the social sciences, no book has dealt with the practical and theoretical implications of using ANT in Tourism research. This is the first book to critically engage with the use of ANT in tourism studies. By doing so, it challenges approaches that have dominated the literature for the last twenty years and casts new light on issues of materiality, ordering and networks in tourism. 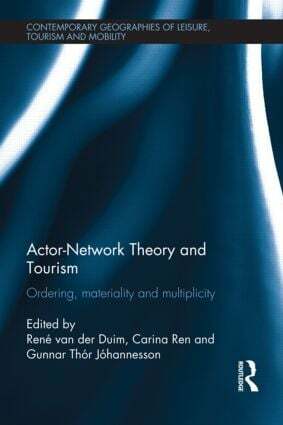 The book describes the approach, its possibilities and limitations as an ontology and research methodology, and advances its use and research in the field of tourism. The first three chapters of the book introduce ANT and its key conceptual premises, the book itself and the relation between ANT and tourism studies. Using illustrative cases and examples, the subsequent chapters deal with specific subject areas like materiality, risk, mobilities and ordering and show how ANT contributes to tourism studies. This part presents examples and cases which illustrate the use of the approach in a critical way. Inherently, the study of tourism is a multi-disciplinary field of research and that is reflected in the diverse academic backgrounds of the contributing authors to provide a broad post-disciplinary context of ANT in tourism studies. This unique book, focusing on emerging approaches in tourism research, will be of value to students, researchers and academics in tourism as well as the wider Social Sciences. René van der Duim has a Special Professorship Tourism and Sustainable Development in the Department of Environmental Studies at Wageningen University, the Netherlands. Carina Ren is Assistant Professor at the Department of Culture and Global Studies at Aalborg University, Denmark. Gunnar Thór Jóhannesson is Assistant Professor at the Department of Life and Environmentsl Sciences at University of Iceland and project manager at the Social Science Research Institute of University of Iceland. The aim of this series is to explore and communicate the intersections and relationships between leisure, tourism and human mobility within the social sciences. It will incorporate both traditional and new perspectives on leisure and tourism from contemporary geography whilst also providing for perspectives from cognate areas within the development of an integrated field of leisure and tourism studies. Also, increasingly, tourism and leisure are regarded as steps in a continuum of human mobility. Inclusion of mobility in the series offers the prospect to examine the relationship between tourism and migration, the sojourner, educational travel, and second home and retirement travel phenomena.